Austria–Hungary and new states that emerged in 1918. 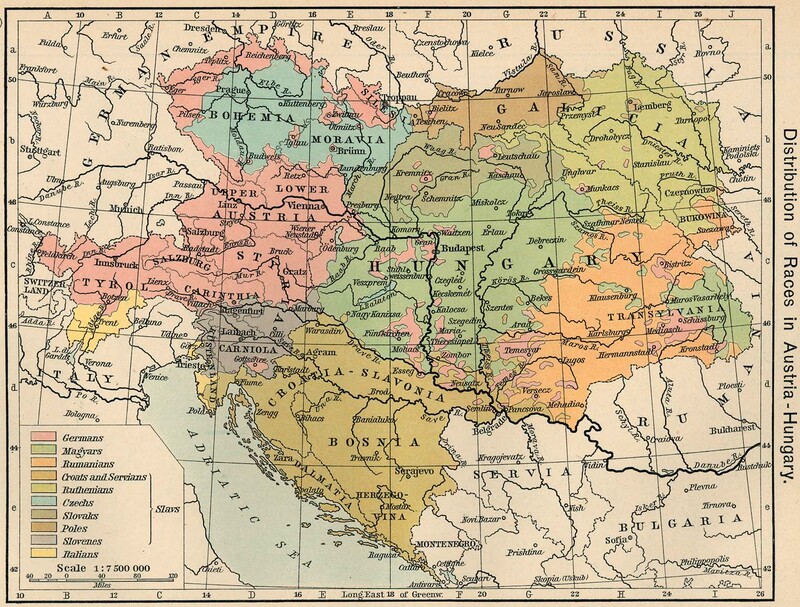 Austria-Hungary or the Austro-Hungarian Empire was a state in Central Europe from 1867 to 1918. It was the countries of Austria and Hungary ruled by a single monarch. The full name of the empire was "The Kingdoms and Lands Represented in the Imperial Council and the Lands of the Crown of St. Stephen". The dual monarchy replaced the Austrian Empire (1804–1867). It started with the compromise between the ruling Habsburg dynasty and the Hungarians. It was an empire made up of many different peoples and great power. It found its political life full of arguments between the eleven main national groups. It had great economic growth through the age of industrialization. It also saw social changes with many liberal and democratic reforms. The Habsburg dynasty ruled as emperors of Austria over the western and northern half of the country and as kings of Hungary over the Kingdom of Hungary. The Kingdom of Hungary had some ability to govern itself. It also had a say in things that affected both it and the rest of the empire. This was mainly foreign relations and defense. The empire's capital was Vienna. Austria-Hungary was the second largest country in Europe (after the Russian Empire). It had the third most people (after Russia and the German Empire). The Ausgleich or compromise of February 1867 created the Empire's dualist structure. The Austrian Empire (1804–67) had lessened in strength and in power. This was because of the Austro–Sardinian War of 1859 and the Austro–Prussian War of 1866. Also, the Hungarian people were not happy with how Vienna treated them. This had been going on for many years and it led to Hungarian separation. This included the Hungarian liberal revolution of 1848–49. Emperor Franz Joseph tried to reach an agreement with the Hungarian nobility. He needed their support to keep the empire together. The Hungarian nobility would not accept anything less than equality between themselves and the Austrian elites. Hungary and Austria had different parliaments. Each had its own prime minister. The monarch kept the two working together. He had absolute power in theory but very little in reality. The monarch’s central government had charge of the army, navy, foreign policy, and the customs union. The deaths of Franz Joseph's brother, Maximilian I of Mexico (1867), and his only son, Crown Prince Rudolf, made the Emperor's nephew, Franz Ferdinand, next in line to the crown. On June 28 1914, the heir visited the Bosnian capital, Sarajevo. Bosnian Serb militants of the group Mlada Bosna attacked Franz Ferdinand's motorcade and assassinated him. Some members of the government, such as Conrad von Hötzendorf had wanted to fight the Serbian nation for many years. The leaders of Austria-Hungary decided to attack Serbia before it could start a revolt. They used the assassination as an excuse. They gave Serbia a list of ten demands called the July Ultimatum. They expected Serbia would not accept. Serbia accepted nine of the ten demands but only partially accepted the other one. Austria-Hungary declared war. These events brought the Empire into conflict with Serbia. Russia moved its army to help Serbia. This set off troop movements on both sides and started World War I. A humorous "obituary" of the Austrian Empire, published in Kraków in late 1918. Click on the image for a translation. Near the end of the war, it was understood that the allied powers would win. Part of the empire started declaring independence from the monarch. They formed their own countries. Some Austro-Hungarian lands were also given to Romania and Italy. ↑ Michael L. Miller. "Austro-Hungarian Empire, 1867-1918". Oxford Bibliographies. Oxford University Press. Retrieved 18 June 2016. This page was last changed on 1 May 2018, at 23:51.